Опубликовано Mark Watkins в 2 февраля, 2017 - 16:43. 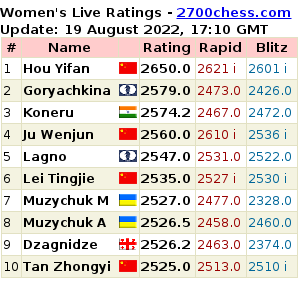 Whatever her complaint, by my understanding, the pairings are completely automated (FIDE rules C.04.2 require this, particularly to avoid the old practice of last rounds being finagled for norm opportunities), and any perception otherwise on her part is simply incorrect. Sometimes statistically outlying events just do occur. The FIDE Code of Ethics could be applied to her behavior (e.g. bringing chess into disrepute). 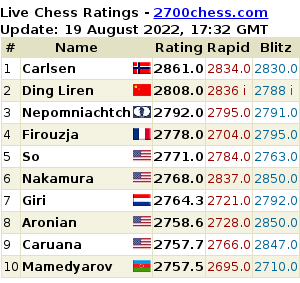 I personally don't see how playing 5 joke moves is worse than simply forfeiting, and there is a precedents for the latter (see FIDE case 6/07, decided in Ethics report in 2010), involving Savchenko (found not guilty), Meier, and Hoyos withdrawing from University of Twente Young Masters (2.2.6 of Code of Ethics). The latter two were sanctioned with a warning, which is the least possible sanction (perhaps for a more high-profile player like Hou a reprimand would be more appropriate). Humpy Koneru's case (6/2015) involved 2.2.6 also, but was ultimately found to be brought by only the organizer (Delhi Chess Association), who unlike a federation was found not to have a "general interest" in chess, but merely a specific one for their event. I must admit I find this a bit strange, as the 2007 case was also only brought by the organizers. В Гибралтаре играется восьмой туре соревнования Masters. Смотрите прямую трансляцию партий. Четвёртый тур соревнования в Гибралтаре стартует в 17.00 по московскому времени. Смотрите прямую трансляцию партий. В Гибралтаре близится к завершению первый крупный опен-турнир этого года. Осталось два тура. Предпоследний, девятый стартует в 17.00 по московскому времени. Смотрите прямую трансляцию партий.